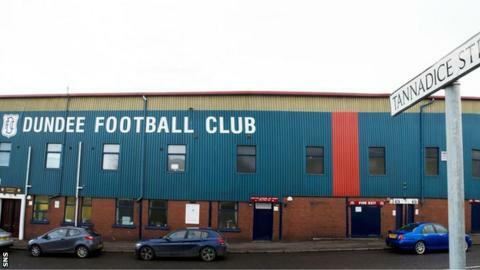 Dundee have begun negotiations to bring Dens Park back into club ownership. Talks between club chairman Bill Colvin and stadium owner John Bennett are under way for the sale of the ground. Bennett, who is also a director at neighbours Dundee United, told BBC Scotland that he is amenable to the sale. "I told Dundee at the time I bought the ground that I would sell it back if it was going into the hands of Dundee fans and I'll stand by that," he said. Dens Park is owned by Bennett in the name of a company called Sandeman Holdings. But, with negotiations under way and depending on a price being agreed between the parties, Dundee fans may soon see the ancestral home back under their own board's control. Colvin said: "We are grateful for John's help at a time when the club needed it. "It was always in our plans to bring Dens back into the Dundee family ownership and negotiations have begun to do that. "Obviously it is dependent on price, but I can confirm that talks are under way with John to buy Dens Park."